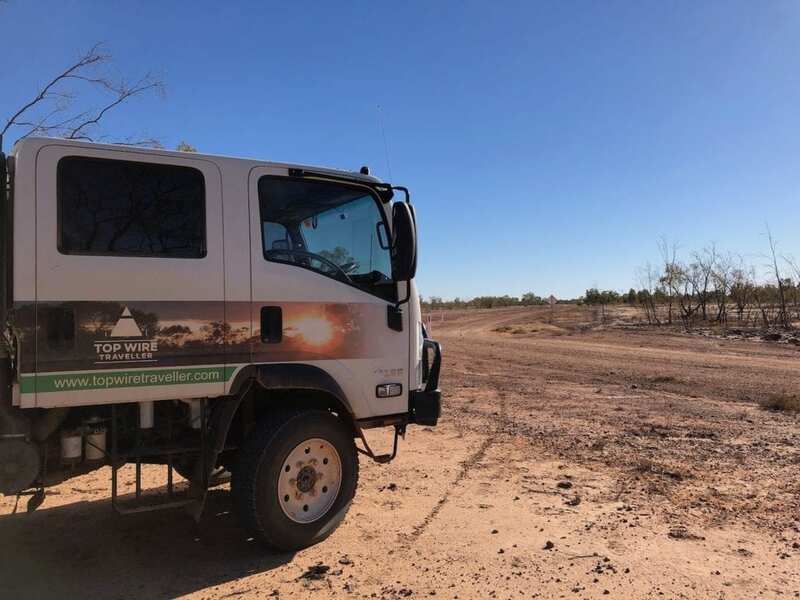 Our Isuzu NPS has aftermarket single wheels with alloy rims and Toyo tyres, supplied new from All Terrain Warriors. After 65,000km, how are they holding up? We answer some of the questions you’ve been asking about these tyres. What Tyres Are You Running? 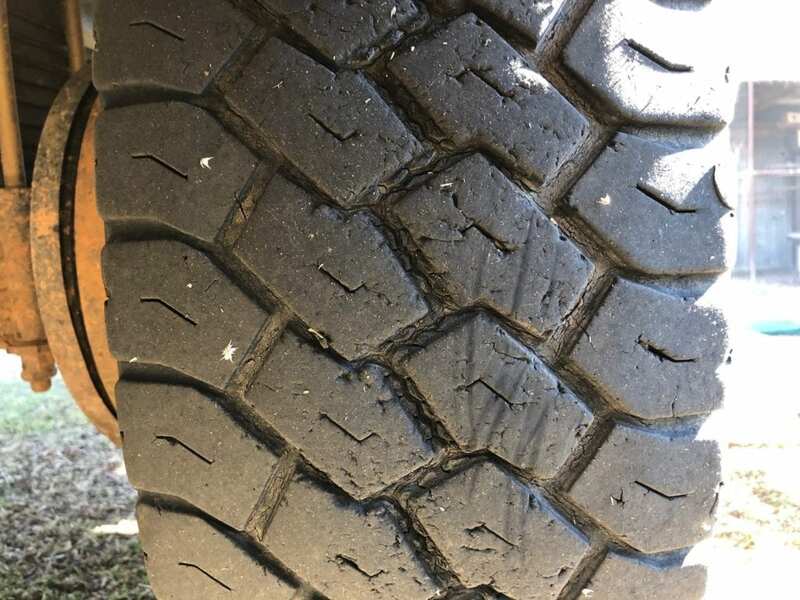 The tyres on our truck have had a hard life at times. 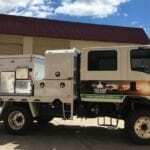 We’re running Toyo tyres, M608Z truck tyres. They are 285/70/19.5, a heavy truck tyre with a full steel casing. These tyres are designed for heavy trucks, as drive tyres and off-road steer tyres. Each tyre has a 2,900kg load rating, so they’re well under-rated on a light truck with a GVM of 7,500kg. What does this mean in practice? Well, the stiff sidewalls don’t bag out much when you reduce tyre pressure for off-road driving. 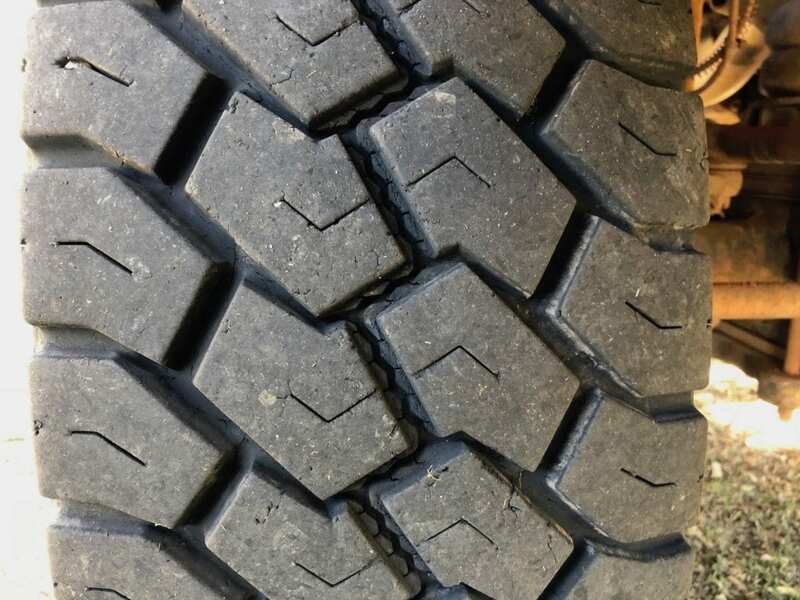 Rather, the tread pattern flattens out and forms a longer contact area with the ground. The biggest plus however is the super-strong sidewalls. We recently dropped down over some really ugly rock steps, with large sharp rocks lying around for good measure. I glanced in the passenger mirror just as the rear tyre sidewall was being jammed hard against a sharp rock the size of a football. It was digging into the sidewall and I fully expected a destroyed tyre. However, the sidewall was fine. No sign of even a nick or a scratch. These tyres really are tough. On bitumen we’ve been running 85psi rear and 75psi front. On dirt roads or off-road conditions we’ve been running 55-60 front and rear. These pressures (cold pressures) are a compromise between ride quality and heat build-up. Of course, what you run will be dependent on what weights you are carrying. It’s all well and good to experiment with tyre pressures. However, it was time to speak to the experts at Toyo Tyres Australia. Actually they contacted me first, after reading my comments about their tyres in this Review of our Isuzu NPS after 2 years’ faithful service. On bitumen, run 85psi rear and 65psi front (we were running 85R/75F). For general off-road use, run 70psi rear and 50 front (we were running 60R/60F). Steve’s most important piece of advice was to contact your tyre manufacturer for expert inflation advice. They are the people who have the knowledge and experience. They recognise tyres are an expensive wear item and want people to get maximum life from their tyres. Let’s move onto the wear patterns we’re seeing on our tyres. First we’ll talk about tyre rotation. All Terrain Warriors supplied the alloy rims. They’re dished on one side and virtually flat on the other. 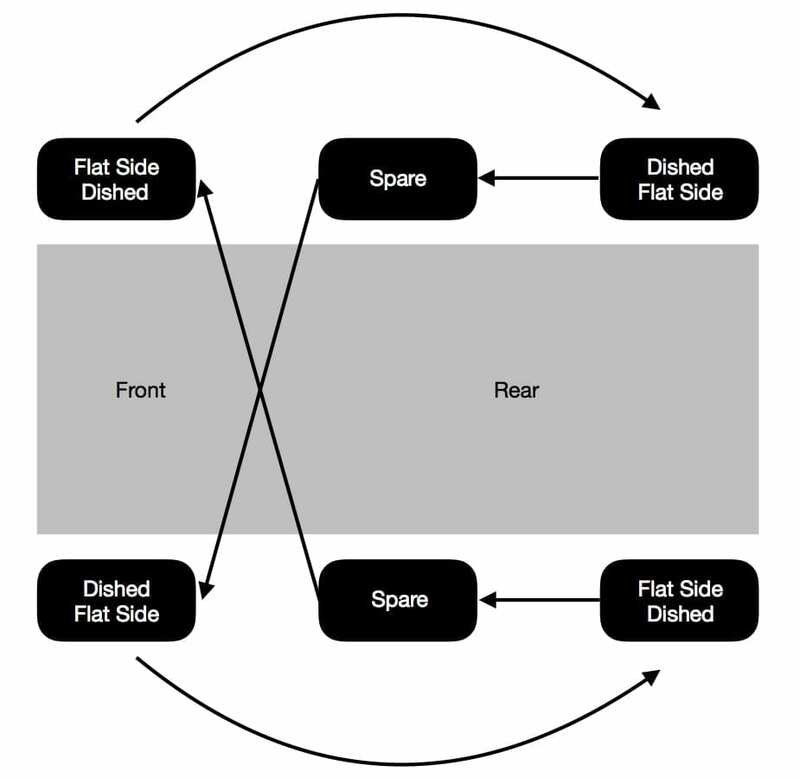 By installing the rear wheels with the dish facing out and the front wheels with the dish facing in, you get the same wheeltrack front and rear. This is great for sand or mud driving, as the rear wheels follow the front wheel tracks. ATW also specified that when rotating the tyres, keep them on the same side. We have 2 spares, so we rotate three tyres on the left and three on the right. The tyres rotate as follows. Rear goes to the spare, spare goes to the front and front goes to the rear. Remember, the tyres are dished. 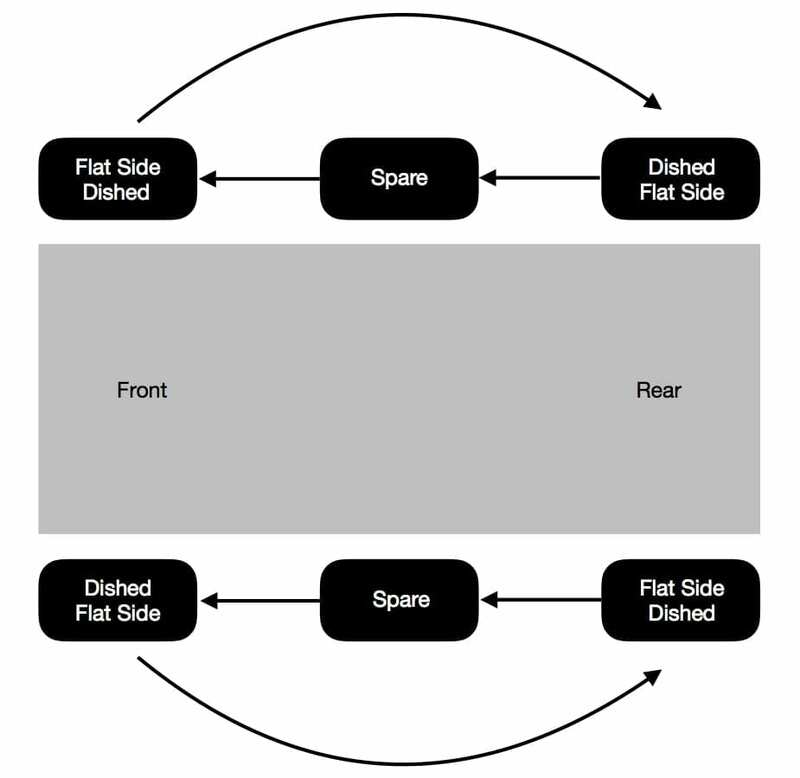 So when they move from rear to front and vice-versa, their direction of rotation changes. This also helps to even out wear. ATW also recommended rotating them every 10,000km, which we did… for a while. We rotated them at 10,000, 20,000, 30,000 then a huge gap to 55,000km. The tyres are now at 67,000km and slightly overdue for rotation. So what happens at each wheel? Well, the left side tends to feather the outer lugs front and rear. The right side tyres wear pretty evenly, with a slight tendency to feather the inner lugs just a little. Both rear tyres feather quite a bit more than the front tyres. What’s feathering? When you see tread blocks next to each other that aren’t the same height, that’s feathering. In other words, front and rear tread block heights are different. Tyre feathering. The lugs wear more on one end than the other. This is totally expected with Australia’s huge road cambers. With the truck always leaning to the left, of course most of the load is going to be on the left of each tyre. The problem with rotating the tyres only down one side of the truck is that the left side tyres take more of the weight. So we’re seeing the left set wear more quickly than the right set. With the next set of tyres, we’re going to try a slightly different tyre rotation. See below. With this rotation sequence, the tyres will be swapping sides. This should reduce the feathering that originates on the left side of the truck. We’ll wait and see, and let you know the results. On final word on tyre wear. 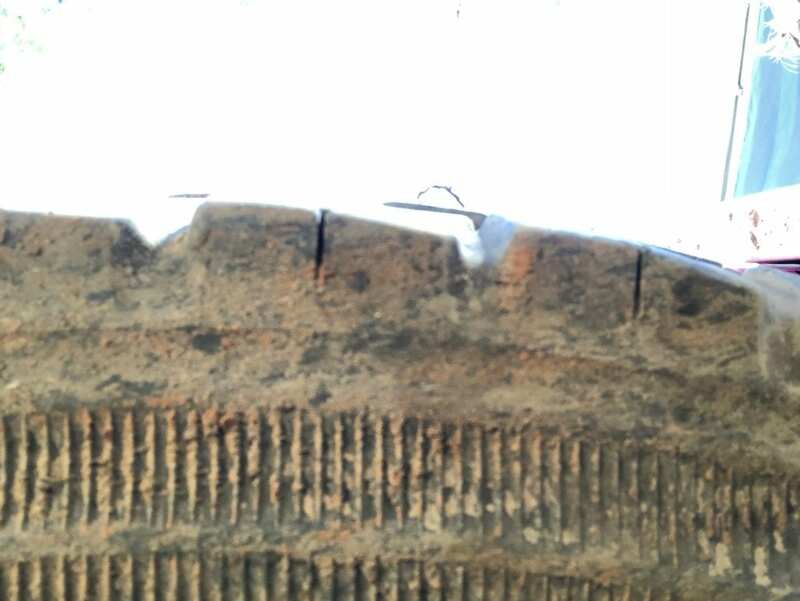 After travelling on rocky dirt roads, the tread on the rear tyres looks a bit like they’ve been chewed by a dog. They have nicks and small cuts all over them. And you’ll see tiny cracks between the lugs. We’re really not concerned by this. While it might not look too good, it’s hardly surprising. The rear tyres are working hard in these conditions. Not only are they carrying the weight, they also have to accelerate the truck and slow it down when the exhaust brake’s in use. 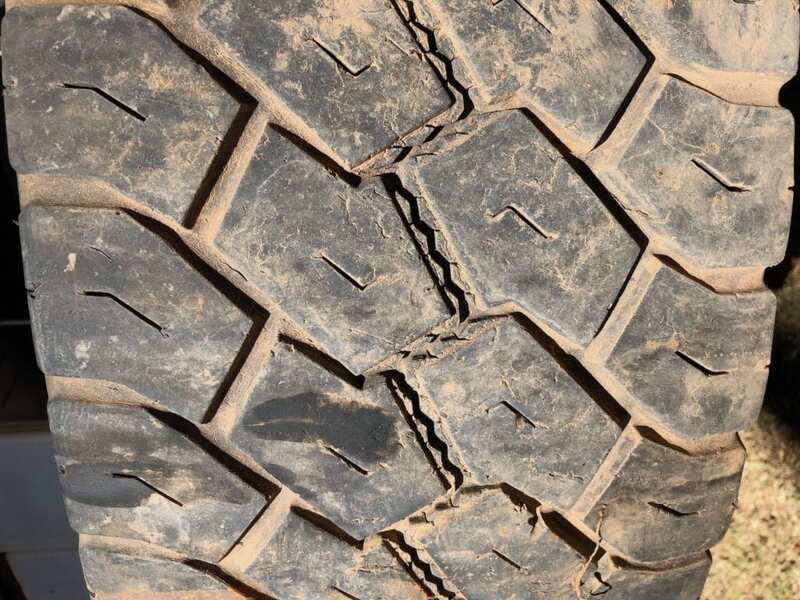 Any tyre that’s skipping and bouncing over corrugations and rocks will see damage on the tread face. 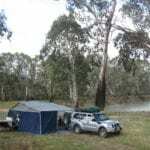 Some people use high range 4WD off the bitumen to take the load off the rear tyres. Personally I don’t, unless the road is particularly steep. The results from drivetrain wind-up on hard surfaces aren’t pretty. I would rather compromise tyre life than be faced with a huge bill for a new diff centre, transfer case or broken axle. 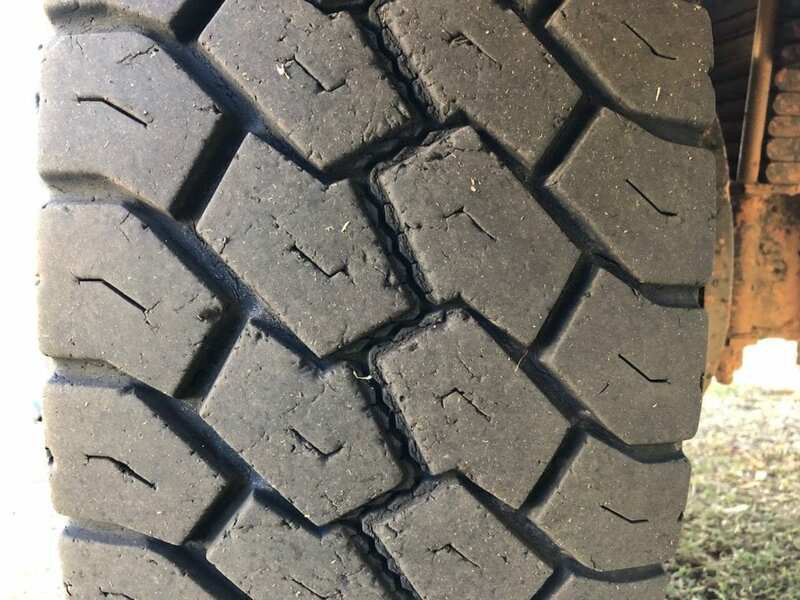 Quoting Steve Burke from Toyo Tyres Australia, “On the topic of feathering, that’s unfortunately a (consequence) of running aggressive drive tyres in the steer position on sealed roads. …considering the requirements of your application, regular rotations and a close eye on wheel alignment is about the best you can do”. It’s a bit hard to say, since we didn’t stick to the recommended 10,000km rotation schedule. And it turns out we haven’t been running Toyo’s recommended tyre pressures either. However, we have at least rotated all 6 tyres every time. We figured out how many kilometres each tyre has actually done, and in which position. Given the current tyre wear, the tyres currently at the left rear and left spare positions are good for another 10,000km, absolute maximum. This equates to a tyre life of 65,000 and 55,000km respectively. The left front is probably good for another 30,000km. So again it’s around the 60-65,000km mark. There’s no doubt the right side tyres are in much better shape. Based on current wear, I’d expect them to last maybe 70,000km. Left rear tyre wear. 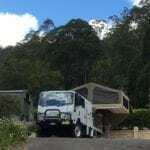 The damage is from hundreds of kilometres of rocky roads before this photo was taken. Left front tyre wear. Note how the front tyres don’t cop the surface damage because they’re not driving. Left spare tyre wear. Pretty badly feathered on both edges. Right rear tyre wear. Still the same damage as the left rear, however feathering is much less. Right front tyre wear. Almost looks new! And this reinforces why I want to change the tyre rotation pattern. The left side chews tyres more than the right side. And both rear positions chew tyres pretty badly. So they need to swap sides regularly. And in case you’re wondering, yes we do check tyre pressures regularly! None. These tyres are brilliant. They’re reasonably quite, sure-footed in all conditions and incredibly tough. 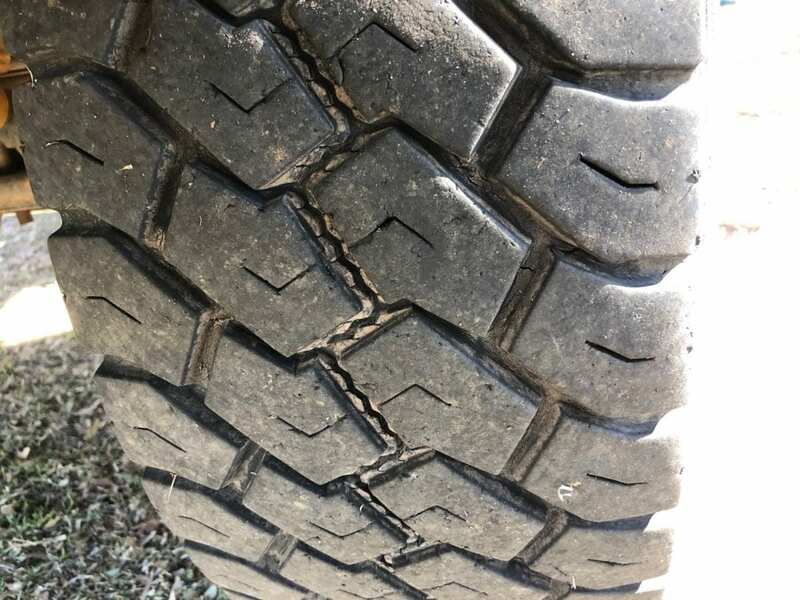 Yes, the tread pattern gets roughed up on rocky roads. However, it’s just surface damage. They don’t lose huge chunks from the lugs. It seems Toyo have the compound just right for Australian conditions. Having said this, the surface damage will of course accelerate tyre wear. To be honest, when we first bought these tyres I expected 80-90,000km from a set of these tyres. But after talking to the Steve at Toyo Tyres Australia, I now understand why they have worn the way they have. With all this in mind, I wouldn’t hesitate to buy another set. 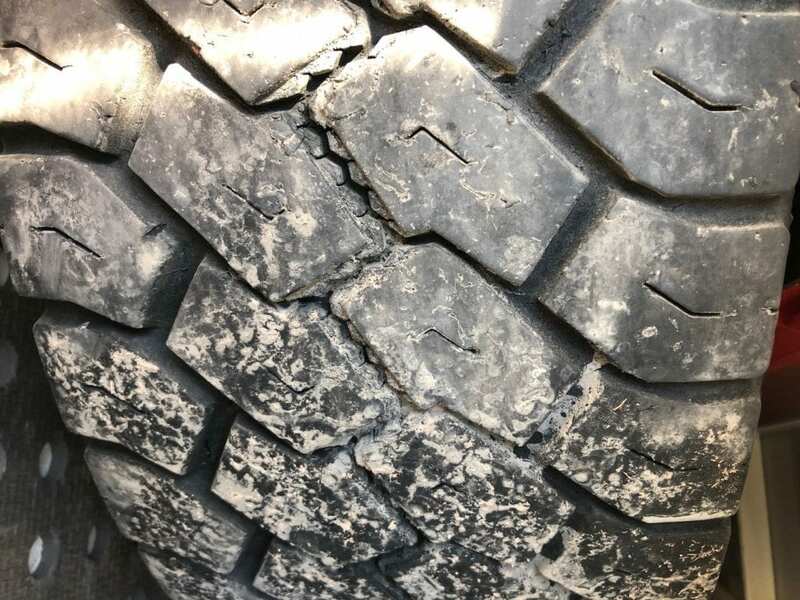 I would rather put up with a shorter tyre life and know these tyres are tough enough to handle anything… a far better outcome than damaging the sidewalls. For various reasons which I won’t go into here, we have replaced the rear and spare tyres with new ones. The front tyres have moved to the spare positions. It will be interesting to see what effect my new tyre rotation scheme combined with Toyo’s recommended tyre pressures has on tyre wear. I’ll keep you posted. If you only take away one thing from this article, it should be this. Contact your tyre manufacturer for expert inflation advice. 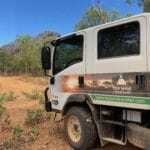 NOTE: We are not affiliated with All Terrain Warriors or Toyo Tyres Australia. Thanks to Steve Burke from Toyo Tyres Australia for his help. (All of our reviews are honest, we tell it how it is).